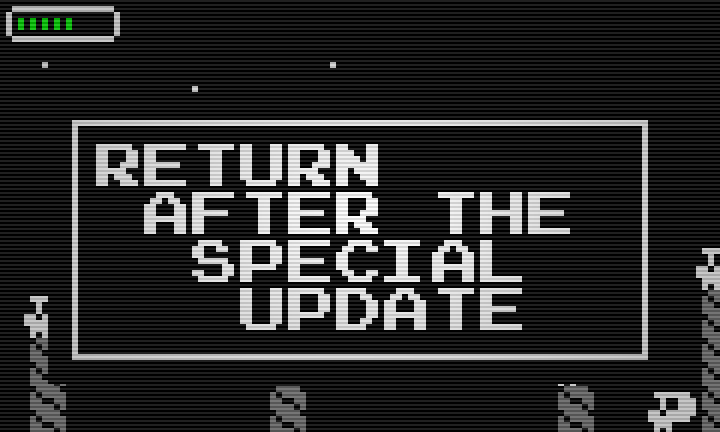 Although Astronot is also available for Mac and iOS, I won't further punish myself by purchasing another copy of the game, so this review will concentrate on the PC version. And I am sorry to say that even from the beginning the signs were not good - when was the last time you bought a game and were confronted by an obtrusive DOS command box running adjacent to the non-resizeable game window? Is this a debug version that was released by mistake? Or is this supposedly part of the retro ambiance? And what are these "Failed to load sound from memory: File is in an unknown format" messages that I see popping up amongst the constant stream of game data? A bug like this is on the titlescreen? Wow. At least running the game in full screen would have hidden this - but nope, there's not even an option to do that in the nonsensical 'sometimes controlled by keys, sometimes controlled by mouse' menu system. Then there's the presentation. Being a site that focuses on new games for 8-Bit systems, at RGCD we know the difference between authentic 8-Bit pixel art and just plain old bad graphics. 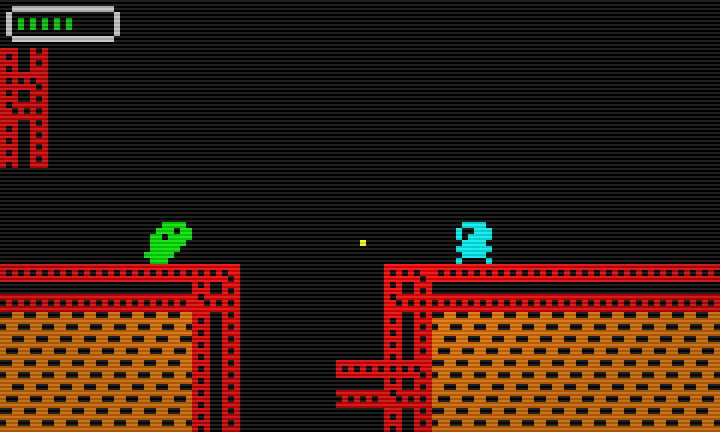 Likewise, we can't be fooled that repetitive two-channel bleeps, buzzes and bloops is a fair representation of what a retro game sounds like. Labelling Astronot as '8-Bit' is quite frankly insulting to 8-Bit machines. I mean, I might have been impressed if this was a game for the C16/Plus4 or VIC20, but as a commercial indie PC/iOS release? Not a chance. 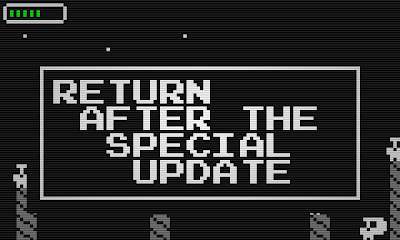 Astronot doesn't even give an indication as to what machine it is imitating (like Terry Cavanagh did with the C64-aping VVVVVV), so I can only assume that the uninspired low resolution art and sound is either due to a lack of talent or a deliberate and unexplained art choice. So far, not so good. However, this is probably because the developer spent his time concentrating on game design rather than boring game options and presentation, right? If only. 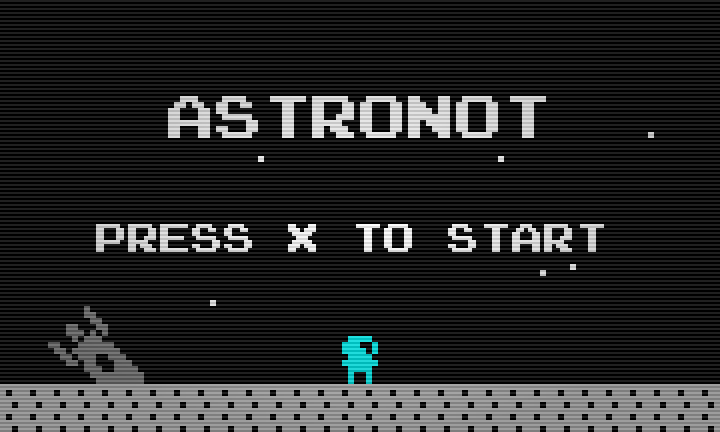 Described as a Metroidvania, Astronot is certainly a big and non-linear game. Initially armed with your peashooter laser gun and a pathetic jump height your exploration options are limited. 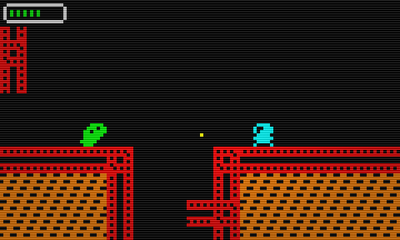 However, after just a few screens in you'll be free to leap over previous obstacles and wander around most of the map. There are switches to flip (although these are far from obvious) and enemies to kill, transporters and even a few boss battles thrown in too. 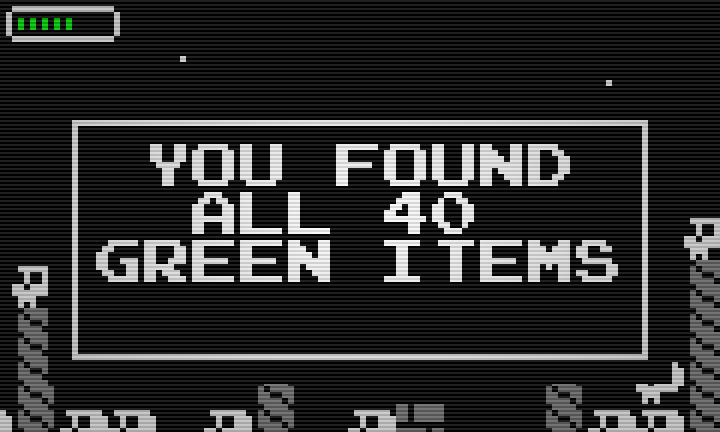 But, with graphics this limited (8x8 tiles) and a complete lack of story, goal or even an explanation as to what you are looking for, it all feels pretty pointless. My favourite part of playing Astronot was experienced after meandering aimlessly for a while through the lava mines. Without warning, I stumbled upon a happy looking giant green bloke stood in an area full of skulls and columns. Unsure what to do, I shot him and was congratulated for collecting "all 40 green items". Checking my inventory I see that I have so far collected one green square. Nice. He then proceeds to tell me that he hasn't got a prize or reward for me, but perhaps I should return after the game has been updated. Hmmm. This means that Astronot was actually shipped knowingly unfinished and seriously bugged - and with no mention of this on the game's webpage. Unforgivable. Is it supposed to be a big joke? Did I miss something? Do I need to be some sort of hipster to appreciate the genius behind this? I really don't know. All I do know is that after an hour's play I am seriously underwhelmed. With that much time invested I should by now be fully immersed in the adventure, but instead I just feel mildly bored and bemused. "So many sights and sounds! ", "So many things to do!" the awful trailer song boasts. That may be true, but what is the point when the experience of doing so is ultimately joyless? 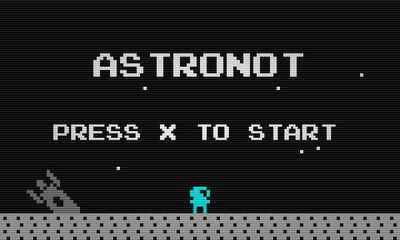 Astronot is a game that I will not be playing again. Don't believe the hype. Hi. I'm the developer. Somehow the download from FastSpring was reverted to the download from may. You have an old version. Sorry. I just pressed ALT+ENTER to get full-screen mode. Then I switched back. Also, apart from the player character I thought the graphics were OK.
Got to agree - 8bit graphics can be beutifull, the graphics in this are just plain lazey and most of the time crap. Sorry but money wasted on this one.